Just Policy Blog: Why Are We Spending So Much To Lock Up Elderly Prisoners Who Pose Little Threat? This submission was originally posted June 13, 2012 on the American Constitution Society blog. Elderly prisoners are the least dangerous group of people behind bars but the most expensive to incarcerate. Yet despite this truth, the number of elderly prisoners is skyrocketing. Harsher sentences for less serious crimes – one defining characteristic of our failed “tough on crime” and “war on drugs” policies – are responsible for this staggering increase in the number of older prisoners, and taxpayers are taking the hit. You may be shocked to learn how much money states are dumping into housing aging prisoners who pose little safety risk. Today the American Civil Liberties Union released a report, “At America’s Expense: The Mass Incarceration of the Elderly,” which details the growth of our aging prisoner population, the low public safety threat elderly prisoners pose and the fiscal impact of incarcerating them. Strikingly, the report estimates that the average aging prisoner costs taxpayers about twice as much as the average prisoner. The report is co-authored by the ACLU’s fiscal policy analyst and in-house economist, Will Bunting. He conducted a fiscal impact analysis, weighing the cost of incarcerating the average aging prisoner against the burden releasing that same prisoner would impose on public benefit programs. 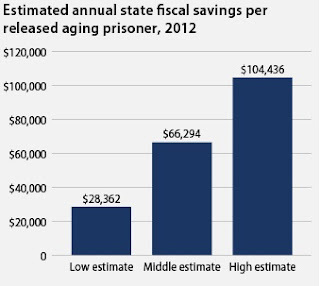 Even taking into consideration the cost of state payments for Medicaid, supplemental security food stamps, energy assistance, and other public assistance benefits, the report estimates that states could save $66,000 per year for each aging person released from prison. To put this number in context, the average American household makes $40,000. The money thus saved could be redistributed to more worthwhile and cost-effective state goals like education and infrastructure. A look at the grander scheme of things is even more startling: in 1988, the United States spent about $11 billion on the entire corrections system. Today, we spend about $16 billion annually on the aging prisoner population alone. As the number of prisoners in the United States climbs ever higher, the number of aging prisoners is climbing even faster. Between 1980 and 2010, the total number of people incarcerated in this country grew by 400 percent. In that same timespan, the population of prisoners age 55 and older grew by nearly 1,400 percent. At the current rate of growth, the number of prisoners age 55 and older will have increased 4,400 percent from 1981 to 2030 and will make up fully a third of the nation’s prison population. The increase in the number of aging prisoners is not due to a spike in the number of crimes committed by older people. There is no “elderly crime wave.” And contrary to popular belief, older prisoners aren’t more likely to have committed a serious crime. Rather, many elderly prisoners are incarcerated for crimes committed in their youth for which they received disproportionately long sentences, and many elderly prisoners are in prison for nonviolent crimes. The current mentality of “lock ‘em up and throw away the key” has led lawmakers to impose exceedingly harsh penalties on individuals who commit low-level offenses, ensuring that they stay behind bars well into age and often until they die. The adage “let the punishment fit the crime” has given way to a reign of disproportionality in sentencing that is nothing if not cruel and unnecessary. For instance, in California, Leandro Andrade, a father of three, received a mandatory sentence of 25 years to life in prison for two counts of shoplifting children’s videotapes valued at $153. He had two prior offenses for misdemeanors. In Mississippi, Atiba Parker was sentenced as a habitual offender to a total of 42 years in prison for selling a total of .3 grams and possessing less than .1 grams of crack cocaine. And also in Mississippi, the now-famous Scott sisters, Jamie and Gladys, were sentenced to two consecutive life terms for a robbery in which they stole $11 when they were teenagers. Like many aging prisoners, Andrade, Parker and the Scott sisters are caught in the net of our extreme sentencing laws enacted since the mid 70’s. Politicians over the last quarter-century have held strong to the conventional wisdom that being "tough on crime" will win elections and appease the public's appetite for safety. To alleviate the public's overblown fear, or even to slake a thirst for retribution, our lawmakers have increasingly deemed more private acts criminal and doled out harsher punishments for a generation. Law enforcement has selectively enforced these laws against the "feared" Black and brown communities. In the end, we’re left with a massive, unsustainable prison population – and equally unsustainable aging prison population – unlike anything the world has ever seen. If aging prisoners posed a serious threat to public safety, the costs of incarcerating them might be justified. But aging prisoners are in fact highly unlikely to commit new crimes upon release. Research has conclusively shown that by age 50 most people have significantly outlived the years in which they are most likely to commit crimes. For example, arrest rates drop to just over 2 percent at age 50 and are almost nil at age 65. In other words, there is no value to the continued incarceration of a large majority of our aging prisoners. Today’s report provides a number of recommendations to legislators and correctional leaders interested in meaningful reform. Given the fact that public opinion is shifting toward a desire for fewer people in prison, the time to implement these reforms is now. The longer term solution requires political will to redesign our extreme sentencing regime to reintroduce proportionality, and repeal or reform habitual offender, mandatory minimum and truth-in-sentencing laws. A more immediate recommendation is for states to empower parole boards to determine which aging prisoners are worth the cost of continued incarceration because they pose grave public safety threats and which are not and can be safely released. In 2011, a bipartisan coalition in Louisiana passed just such a reform measure; if Louisiana – which leads the nation in incarceration – can take these steps, other states can surely follow suit. In today’s hobbled economy, legislators cannot continue wasting taxpayer dollars by turning our prison system into a vast complex of nursing homes. It is a moral and fiscal imperative to stem the explosion in the aging prisoner population. Aging prisoners pose little threat to the public’s safety and incarcerating them is breaking our collective bank. Furthermore, it is inhumane to keep people locked up when there is no compelling societal justification to do so. The tools for grappling with this crisis are well within reach of legislators around the nation and the time for reform has arrived. Inimai M. Chettiar is Policy Counsel, and Vanita Gupta, Deputy Legal Director, at the American Civil Liberties Union.